Today, I would like to share another Danish recipe. In Denmark we refers to this recipe as ‘Hens in Tartlets’ or sometimes simply just ‘tartlets’. 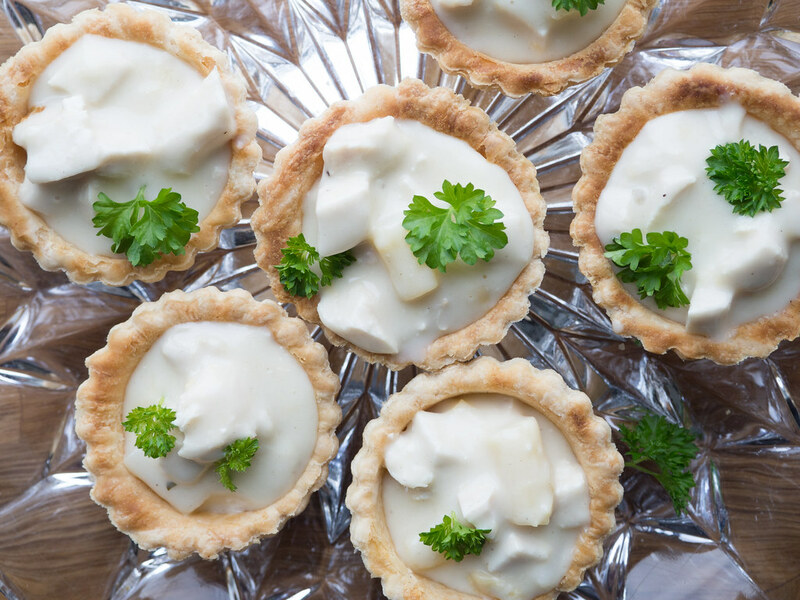 Hens in tartlets is an old and very traditional Danish recipe. Even though, this is an old dish it is still very popular and is typically served at buffets at restaurants around in Denmark, at Christmas dinners or maybe just at home, a Saturday evening, when you are hungry for traditional Danish food. They are sometimes uses as a starter because of their relatively small size and ‘lightness’. However, they are also sometimes served as the main course typically together with some other food. 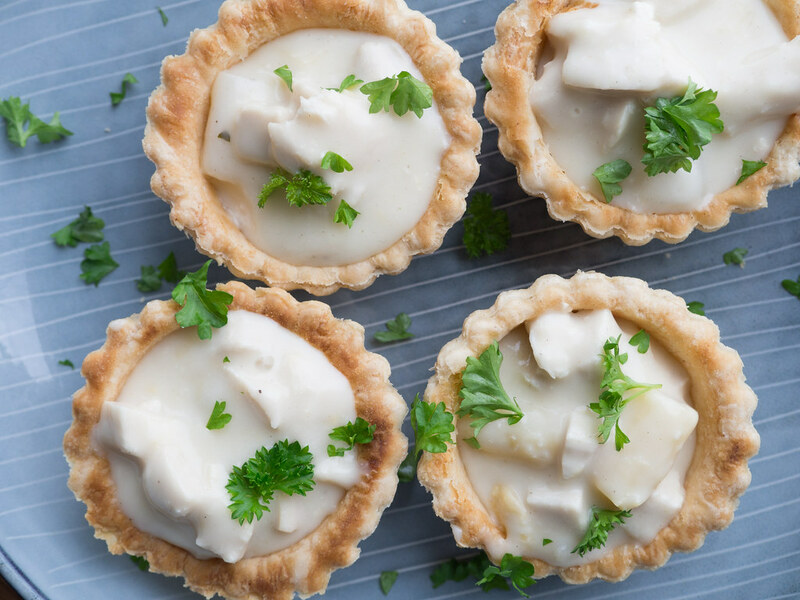 The traditional way of serving this chicken and asparagus sauce is in the small crisp bread cups called Tartlets. Danish Tartlets are a very common thing in Denmark and can be bought in most super markets and grocery stores. They are very cheap and typically comes in packs of 10-15 Tartlets. Unfortunately, I am quite sure these crisp Tartlets are a Danish thing and I think they can be very difficult to buy outside Denmark. However, I think you can get them from some bakeries or maybe a Nordic food store if you have one of these in your area. If you know a good store, outside Denmark, which sells these Tartlets or maybe just something similar, I am sure other readers of my blog would love to read about this in the comment section below. 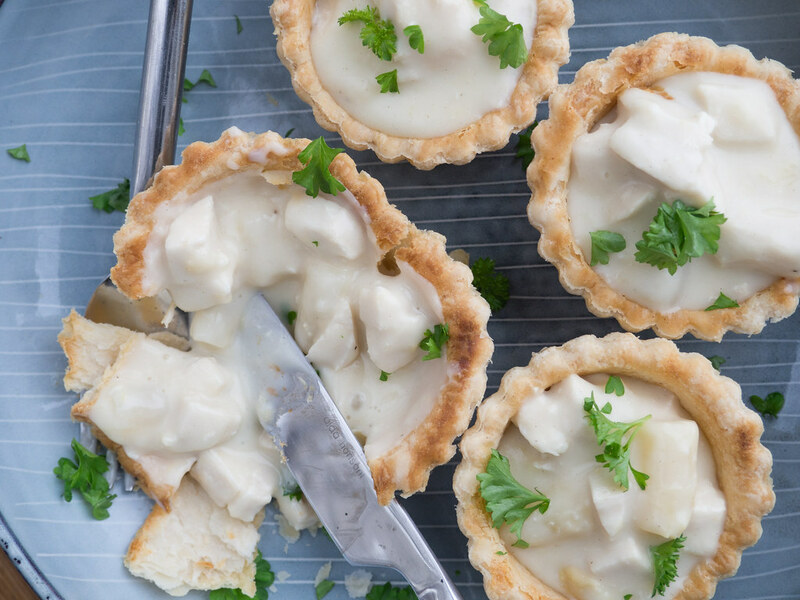 In the traditional recipe for Danish Tartlets is it actually not chicken breast filet that is used as the meet. The problem with the chicken filet we can buy nowadays is that the chicken is raised in record time – sometimes as low as 30-40 days are used to raise a chicken from the cracking of the egg to the butchering. Besides the fast growth, the chicken filet is also typically pumped with saltwater. These two factors results in some chicken meat that can sometimes be a little doll in the taste. In the original recipe the meat comes from a whole hen which has not been fast raised. In the old days in Denmark, it was the hens, which were too old to lay eggs that were used in the recipe for Tartlets. The meat on old hens is too tough for frying but it is still full of great taste and is therefore perfect for this recipe where the meat is cooked in water. Whether you are using the old and traditional way with hens meat or the quick version using chicken filets, I normally estimates about 60 grams (2 oz) of meat per person. In Denmark, it is very difficult to find fresh white asparagus when they are off-season. In the off-season, I always uses the caned asparagus, which I personally think is a great alternative to the fresh ones. However, if you can find the fresh asparagus I will of course recommend them to get the best taste. In a sauce pan; bring about 1,5 liter (1/2 gal) of water to boil. Add some chicken stock and the chicken filet. Cook the chicken filet for about 20 minutes. The chicken most be cooked all the way through but not over-cooked. When done, dice up the chicken in small pieces of about 7×7 mm (1/3×1/3 inch). Save the water used to cook the chicken. The white sauce is made from the few ingredients; butter, all-purpose flour, milk and then some of the water used to cook the chicken or the asparagus. Especially, the last part is important to get the best taste. The water used to cook the chicken is full of great taste and is perfect as a base for this sauce. Alternatively, you can use the water from the cooking if the asparagus. 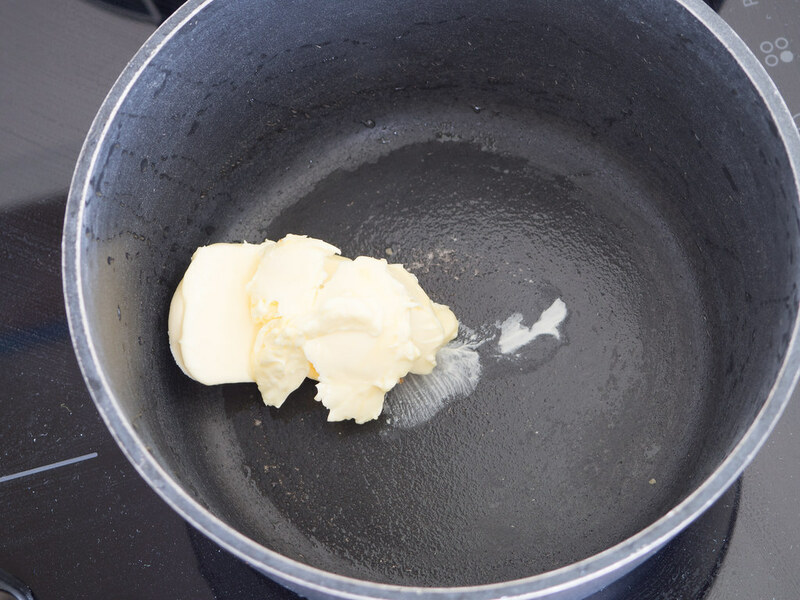 You start by melting the butter in a saucepan, and then you step-wise add the all-purpose flour while whisking the butter into the flour. 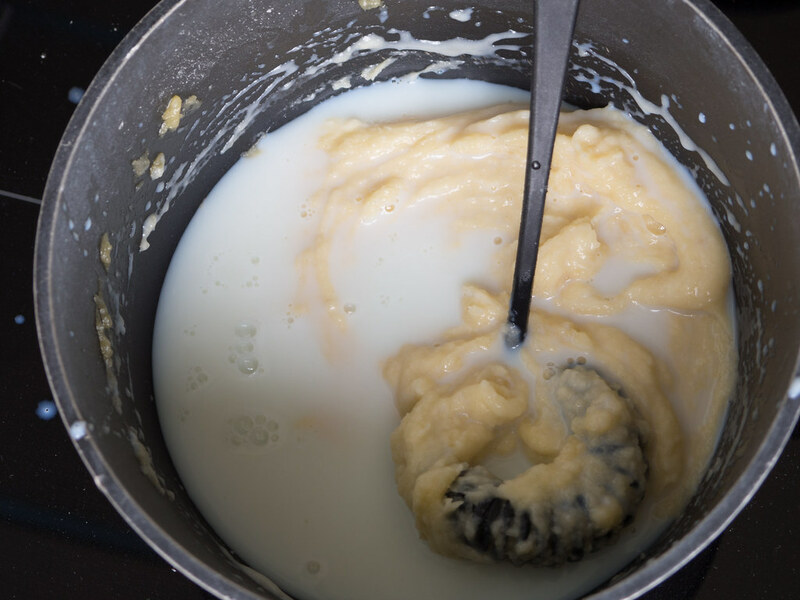 Once all the butter and flour is mixed into one stick butter-flour ball then you add the milk and the cooking water from the chicken step-wise, again, while whisking. 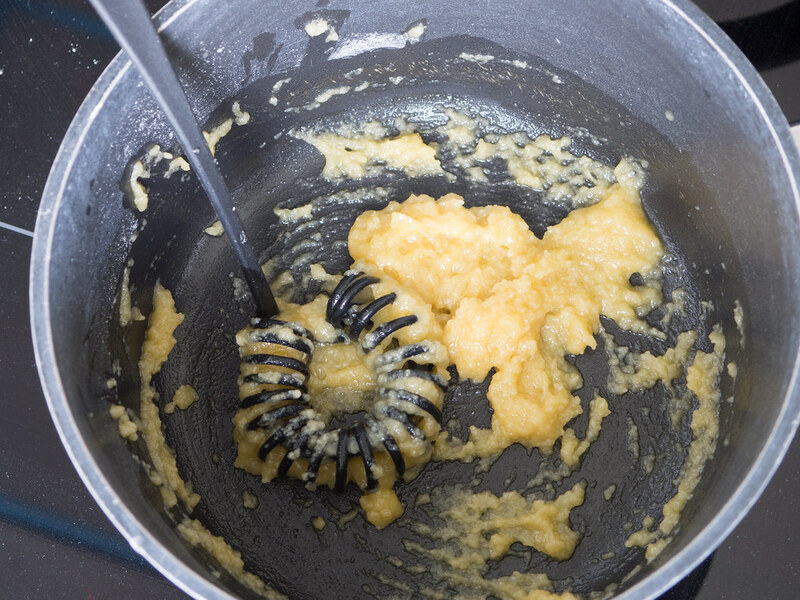 It is important that you whisk a lot to get rid of the flour lumps. Let the sauce simmer for about 5-10 minutes or until the consistency is nice and thick. The thickness of the sauce should be relatively thick and not too liquid. When the sauce is almost ready add the cooked chicken and the prepared asparagus and heat everything up. Warm the tartlets in an oven for a couple of minutes. 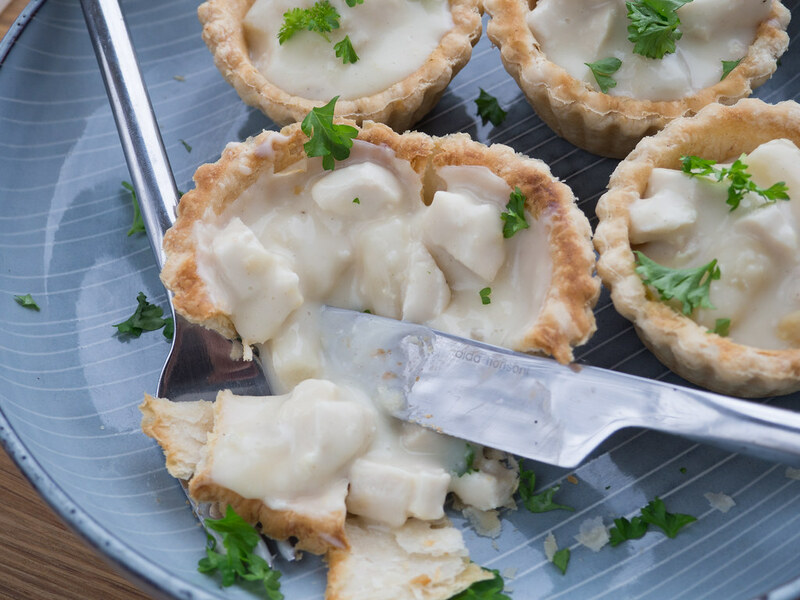 Fill each tartelet with the white chicken and asparagus sauce. 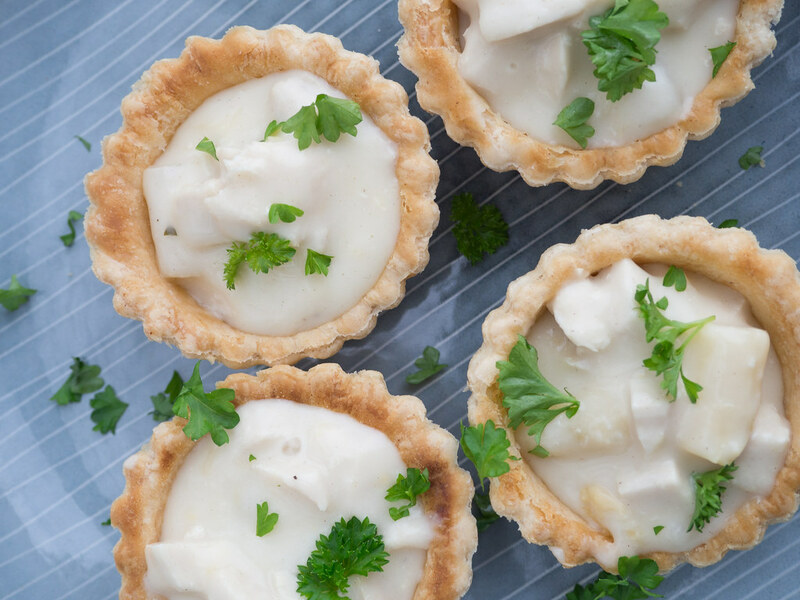 Decorate the top of the tartlets with freshly chopped parsley. 1. Start by bringing about 1.5 (2/5 gal) of water to boil. 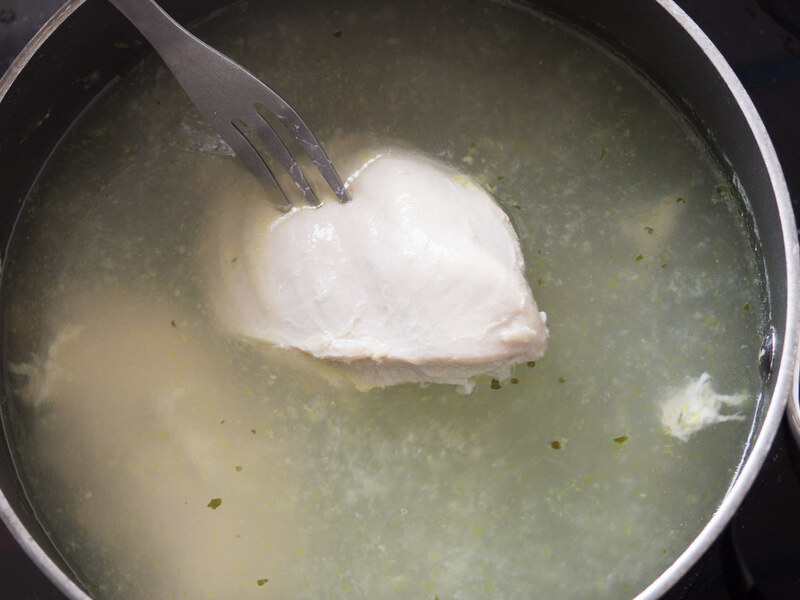 Dissolve the chicken stock in the water. 2. Add the chicken breast filets to the water and let them cook for about 20 minutes. They must be done in the middle but try not to over-cook them. 3. When the chicken is done; cut the chicken into smaller pieces about 7×7 mm (1/3×1/3 inch). Remember to save the water used to cook this chicken. 4. 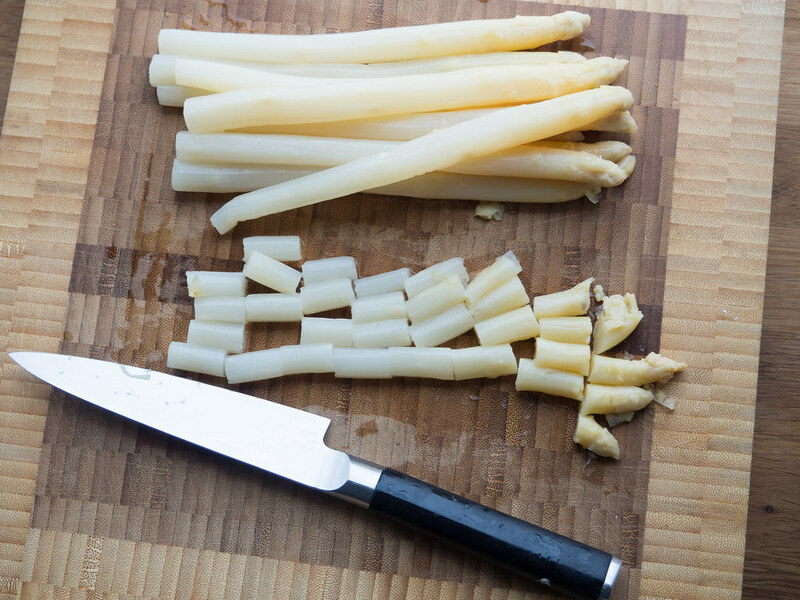 If you uses fresh white asparagus; clean them and boil them to tender in water – you can also just caned asparagus. Cut the cooked asparagus into smaller pieces with a length of about 2 cm (4/5 inch). 5. Continue by preparing the white thick sauce. 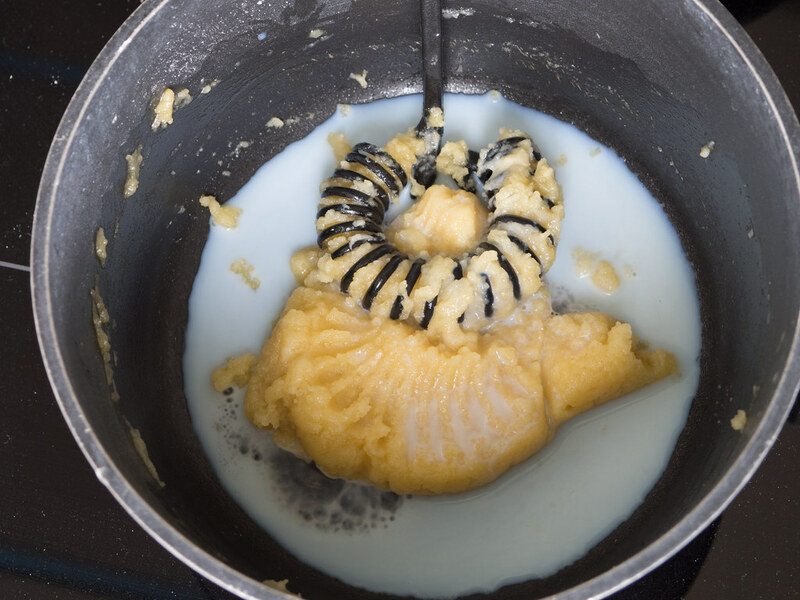 In a saucepan; add the butter and slowly melt it. 6. 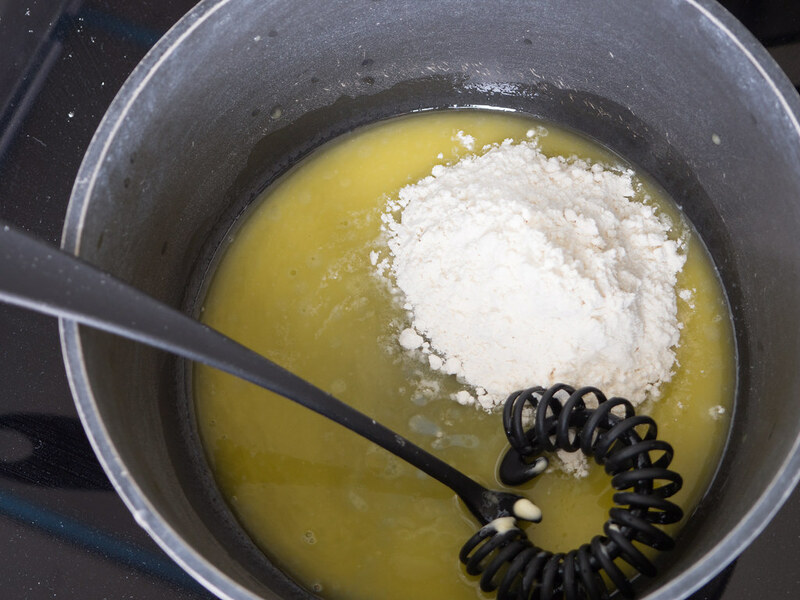 Add the all-purpose flour to the butter. Whisk everything into a nice butter-flour mixture. 7. Step-wise add the milk and the water (only 2 dl or 4/5 cup) used to cook the chicken. 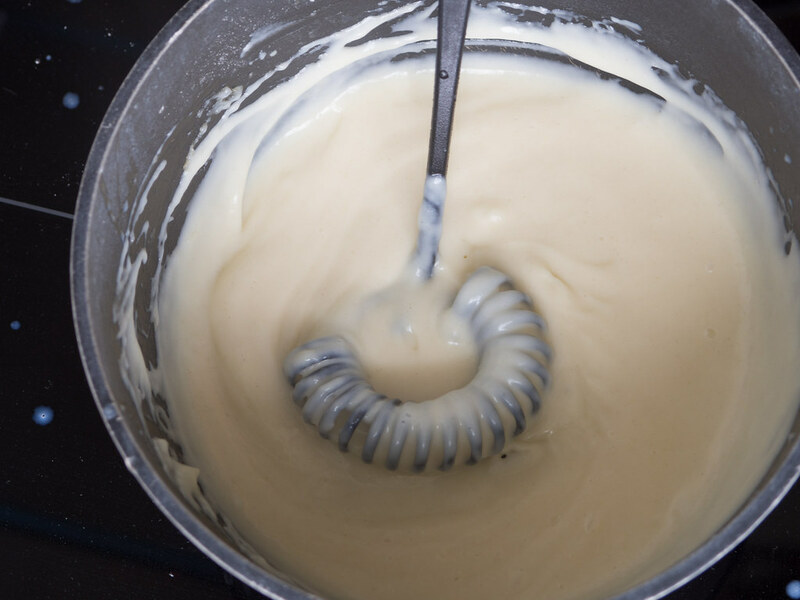 Whisk continuously until all flour lumps are dissolved. 8. Let the sauce simmer for 5-10 minutes or until it has a good and thick consistency. 9. Add the prepared chicken and asparagus pieces. Let it heat up in the white sauce. 10. 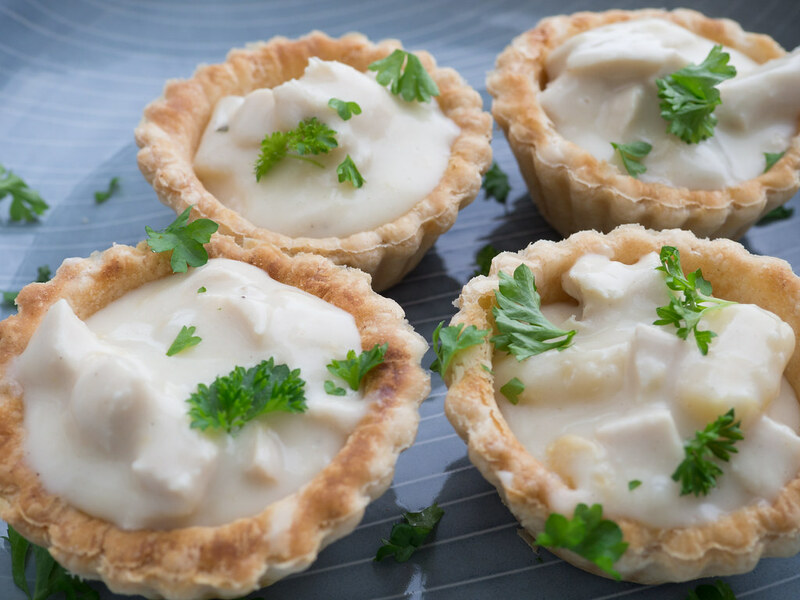 Warm the tartlet cups and fill them with the chicken and asparagus sauce. Decorate the top with chopped fresh parsley. It was a pleasant surprise finding your site. Have been living in Connecticut US for 1½ year now. Making most of our Danish food our self, also leverpostej. I can recommend the Scandinavian Butik located at 349 Main Ave, Norwalk, CT 06851. They have Tarteletter among others, and internet shop. I just spent Christmas in DK with my son who has returned to the land of his birth to finish school. I forgot how much I love lever posted! Would you kindly share your recipe with me and my husband?